Macapa, the capital of the Brazilian state of Amapa, lies just on the equator. At the entrance of the city stands the Sao Jose Fort, an example of the French influence on the city. Another point of interest is the oldest monument in the city, the Church of Sao Jose de Macapa. 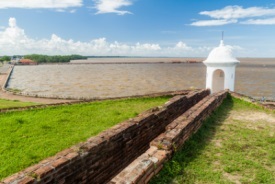 The church was built in Jesuit colonial style, and is another reminder of the rich, colonial history of Macapa. At Casa do Artesao, tourists can find numerous indigenous arts and crafts to take home as souvenirs.